Adventures come in many guises and it is only a year after my contemplative nihilistic musings on the steps of my old flat, that I am inhabiting a new one. The expedition i've longed for is of a different nature - one of exploring a new area of London, and the pitfalls of property ownership. A challenge I was seeking, and one was provided. And it is with intermittent exhilaration and groans of irritation that I face what the day brings. Now it's a mystery charge applied by the freeholders, now it's discovering a plethora of exotic supermarkets catering for the diverse local demographic, now it's the lack of recycling in my newly adoptive hood, now it's a surprise hipsterish steak restaurant in what is otherwise a sea of something-fried-chicken takeaways, betting shops and caffs, now it's the tricky art of neighbour diplomacy, now it's the joys of deciding on how to decorate my new home - paintings, furniture, all the bits and pieces I'd never given a second thought to before. 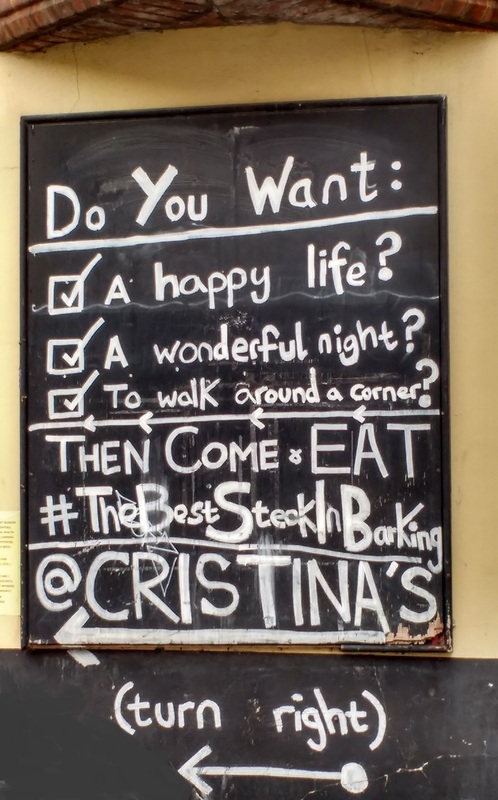 But it's the steakhouse that's worth elaborating on. An utter anomaly for the area, discovered on the day I moved. Suspicious of my new surroundings' cultural thinness and provincial leanings, lack of decent pubs, yet still determined to grow to love it, I paced the streets with a friend. We strolled past the tube station, through the pedestrianised high street with its low-rent Pound shops and cash-converters, and through the market selling net vests and plastic wallets. We were determined to be charmed and so walked to the very last stall. Huh, we thought, we do indeed like all of those things, not least walking around corners. Let us follow the suggested course. 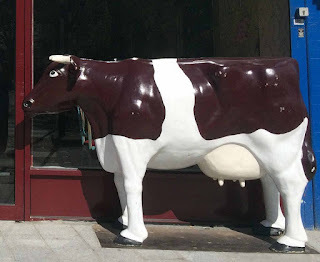 Turn right we did, encountering a life-size bovine model outside what could have been a foodie spot plucked out of Dalston high street. But here, in suburban London. Buffed wooden furniture: check. Deliberately placed quirky ornaments: check. Claims for high quality ingredients: check. Aloof staff: check. We weren't hungry, however we couldn't resist a nose around the premises, and were enthusiastically greeted by the self-professed financier, a man I would categorise of the "too posh to wash" ilk. He fluttered around us explaining his and business partner Cristina's vision of pushing the area to culinary eminence, facing off against some of the best London notable steak restaurants. 'Goodmans, Hawksmoor...?' I inquired. 'Erm... yes' he maintained, grasping onto his air of conviction. 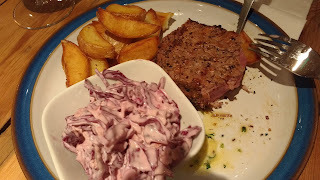 I decided that, true or not, this place deserves a try - the menu offered excellent value and wasn't pretentiously complicated, just steak and lots of it. 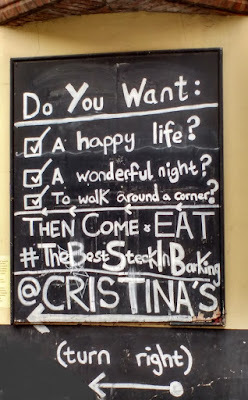 Besides, being as it evidently is the only vestige of fine dining in Barking, my only link back to urbanite sophistication, it would be foolish to dismiss it. A few weeks later, following a lazy yet weary Sunday with overworked friends, we found ourselves crossing that threshold, with intention to dine this time. Service was lacklustre, verging on the irritable. however, we were tolerant of the fact, as we seemed to have happened upon a celebration of some kind, and staff may have been under duress preparing for the night - attendees adorned in shiny polyester shirts, pointy shoes, sparkly dresses and heavy perfumes, plus a long table set for a blowout party with many bottles of spirits, wine and beer. Attempts to guess at the occasion ranging from christening, confirmation, wedding, even funeral were speculated, but we were too tired and hungry to actually engage with the revellers. To our dismay, they eventually betrayed our gleeful sense of impending riot by maintaining cool and sober decorum throughout the evening. Damn. The restaurant filled quickly with other diners, some clearly regulars, and we were optimistic. 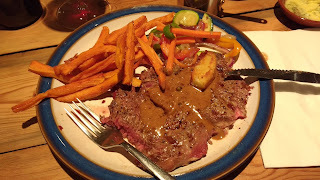 The food, when it arrived, was good but not great - the steaks mainly prepared well, but not as one would expect in the more established London steak joints - the meat has not been prepared with the appropriate heat, it seemed. Fat not crisped enough, sinew more evident than it should be, and even the fillet had a damp, cold quality as if it hadn't had time to thaw out properly before being tossed into he pan. And you've gotta wonder, given the profit margin, could these be superb cuts of beef at these prices? I'd like to believe this must be due to a special arrangement forged with an excellent and ethical meat supplier, but I'm afraid my cynical leanings won't let me. Sides were tasty, although on the under-seasoned side, and we only got one portion of chips instead of two; however, the bill came to about £25 per head, including a bottle of a decent Vinho Tinto, and I'm certain the lunch menu at £6 for a main and sides, and even the Sunday roast menu for £10 are more than satisfactory. The claim to quality and style and dogged stubborn insistence on being the leading steak eatery in the area is certainly justified, given that competition is non-existent. And no doubt I would be making repeat visits when I feel the steak urge coupled with a wish to stay local. The restaurant is doing well, management is eager and clientele is loyal, it appears. Somehow, though, for local eats I prefer the excellent Kolachi, a Pakistani restaurant down the road. Drafty, cramped and garishly decorated with a candelabra, it serves truly authentic Karachi homey food, bowls of glistening lentil and chickpea and slow-cooked lamb stews, served with a side plate of herbs, ginger, limes and crisp fried onions to be sprinkled at your leisure over the dish, or a plateful of expertly grilled chops and skewered meats, aromatically marinated. Here you are expected to eat with your hands and/or paratha and naan baked a minute ago on the tandoor. No sophistication but no pretension either. Here I found the essence of what my new home ground is about. '..cultural thinness and provincial leanings' ??? But hey, at least that Pakistani place looks good eh. Ha! I only moved to Barking for the dogs... what a disappointment!! Yeah not only is the food fantastic at that Kolachi restaurant, but I actually laughed out loud (Lolled, if you will) when we got the bill. Ridic cheapness!